Much has been published about the children of Capt John Walden Meyers and Polly Kruger and no attempt to produce an exhaustive account will be made. This page is dedicated to collecting some contemporary records about the children that come my way. Feel free to send me any information that is worth adding. CAPTAIN JOHN WALDEN MEYERS , U.E. was born on 22 Jan 1745 in Albany, NY. He died on 22 Nov 1821 in Belleville, Ontario. He married (1) MARY (POLLY) (CRUGER) KRUGER in 1765. She was born in 1745. She died about 1816. He married (2) Sophia Huffnel after 1816. 1. GEORGE W.5 MEYERS, U.E. (CAPTAIN JOHN WALDEN4, HANS JERG (GEORGE)3 WALDENMAIER, JOHANN GEORG2 WALTERMAIER, MATTHAEUS1) was born 24 September 1765 in Wurtenburg, Rhinebeck, Dutchess Co., NY. He married ALAIDA VANALSTINE 5 May 1789, daughter of MAJOR VANALSTINE and ALIDA VAN ALEN. She was born Abt. 2 March 1772 in Kinderhook, NY: PLBQ p. 827; date & place WFT, and died Abt. 1872.
i. MARY6 MEYERS, m. JAMES VANDERVOORT, 16 July 1809, Sidney1. ii. PETER W MEYERS, m. ELIZABETH YAGER; b. 28 March 1800, Claverack, Columbia Co., NY. iii. REBECCA MEYERS, m. PETER VANDERVOORT; b. 1784; d. 1840.
iv. NANCY MEYERS, m. JOHN LEONARD W. MEYERS. v. ALICE MEYERS, m. GEORGE WESTFALL. vii. CATHERINE MEYERS, b. 1796, Sidney, Hastings County. viii. TOBIAS WALTER MEYERS, b. 26 May 1798, Sidney Twp., Hastings Co., ON; d. 11 October 1887, Sidney Twsp, Hastings Co. Ont. ; m. CHRISTINA HELEN YAGER; b. 11 October 1807, Claverack, Columbia Co., NY; d. 12 October 1900, Sidney Twsp, Hastings Co. Ont..
ix. JOHN G. W. MEYERS, b. Abt. 1800, Upper Canada; m. (1) CATHERINE MEYERS; d. Bef. 1851; m. (2) MARY (POLLY) ROW; b. Abt. 1810, Upper Canada. x. ALIDA (ALLEY) MEYERS, b. Bef. 29 June 1800; m. HARMON ROW. George Walden Meyers of the eighth Township of Catarakwee, called Sidney, Batchelor, and Alleday Van Alstine of the fourth Township of Catarawkee, called Adolphustown, Spinster, were married in this Church by Banns this fifth Day of May in ye year of our Lord one thousand, seven hundred, and eighty nine by me. Source: copy of registration, Anglican Register 1787 - 1814, Anglican Archives in Kingston, emailed by Carol Evans, March 2009. Thank you Carol. Johan Joerg, son of Johan Waldemeyer and Maria, bap 13, 10 month, 1765 and born 24, 9 month 1765. Sponsors Joh Joerg Waldemeyer and Margaretha. On 6 Sept 1787, George and Tobias Meyers are entitled to 200 acres and have drawn Lot 7 in front, consisting of two hundred acres in full in Seignure of No 8 (became Sidney). Source: Township Papers, Hastings, AO, MS 658, reel 442, #87, copy Meyers files. On 17 July 1790, George Meyers granted 200 acres, Lot 29, 5th Concession, Sidney on 7 Jul 1790. Source: Township Papers, Hastings, AO, MS 658, reel 442, #733, copy Meyers files. Captain George W. Meyers, Hastings Militia, date of commission is Dec. 10, 1798, dated Feb., 10, 1799. Source: Early Militia Lists of Hastings County 1799-1826, from the William Bell Papers; compiled by Don Kellaway, 1994, Quinte Branch, OGS, p. 1. Meyers, George Walden is listed as a Major (date of rank September 5, 1807) in the 1st Hastings Regiment. Source: Soldiers of the King, Upper Canadian Militia, 1812 - 1815, reference guide, Wm. Gray, 1995, p. 66. William Johnston and George W Myers, executors and Rebecca Crysdale, widow, executrix and testament of the late John Crysdale, Sydney, yeoman, deceased, claim lot 21, Con 5, Sydney ..... John Crysdale who was the origianl nominee of the said lands; dated 8 Jan 1808. Lot 10, Conc 6, deed #1106, in 1824, Geo and Alida Meyers sell lot 10, Conc 6, Murray Tp to Nancy Meyers and Lot 11, Conc 6, Murray to Eliza Meyers. A letter from an anonymous writer to William Lyon Mackenzie, dated 8 Feb 1839, describes a "George W Meyers, son of Colonel Meyers of Belleville," who was on the wharf in Belleville and said he "going to look after Mackenzie". An informant reported this and George was arrested. According to the letter his father "an old Loyalist" got one of his brothers to tell the jailer that a different Mackenzie owed George money and if he would check George's account book he would see that he was wrongly accused. He was released. Source: The Rebellion of 1837 in Upper Canada, Colin Read and Ronald Stagg, Carelton Univ Press, 1985, 436, Thanks to Guylaine Peltrin for alerting me to this reference. CATHERINE W.5 MEYERS (CAPTAIN JOHN WALDEN4, HANS JERG (GEORGE)3 WALDENMAIER, JOHANN GEORG2 WALTERMAIER, MATTHAEUS1) was born 18 Mar 1767 in Wurtenburg, Rhinebeck, Dutchess Co., NY, and died Abt. 1791 in Upper Canada. She married JOHN BLEECKER 07 Oct 1788 in 8th Town (Sidney). John Bleecker's second wife was Mary Meyers, sister to Catherine. Margaretha, dau of Hannes Waldemeyer and Maria, bap Advent, 4 month, 1768 and born 24, 11 month 1768. Sponsors Joerg Waldemeyer and wife. Note: this child may have died young. Tobias WALDEN MEYERS-2392 was born 1770 in , Dutchess Co., NY, USA and was christened 2 Dec 1770 in Kinderhook, Columbia Co., NY, USA. Recorded: Kinderhook Dutch Reformed Church, Kinderhook, Columbia Co., NY USA. Parents: "Johanne Waltenmeyer, Maria Gruber". Sponsors: "Hendrick Duycker, wife Margrieta Ditzelin". Source: excerpt from the book by Herman Witthoft, Sr.
1. LEONARD5 MEYERS (CAPTAIN JOHN WALDEN4, HANS JERG (GEORGE)3 WALDENMAIER, JOHANN GEORG2 WALTERMAIER, MATTHAEUS1) was born 1772, and died Bef. 17 October 1830. He married (1) MARGARET ACKERMAN 14 April 1793 in Fredericksburgh and she died bef. 1807. He married (2) LENA WESTFALL. i. RACHEL6 MEYERS, m. WELLS MUNN. ii. ANNIE OR NANCY MEYERS, m. JOHN BROWN. iii. MARGARET MEYERS, m. JOHN SMITH. iv. JOHN LEONARD W. MEYERS, m. NANCY MEYERS. vi. MARY MEYERS, b. 17 October 1800; m. PETER VANDERVOORT; b. 1784; d. 1840. 47 M v. Leonard (Leendert) WALDEN MEYERS-2462 was born 1772 and died before 17 Oct 1830. Source: Bill Martin's web site, Ontario Hist. Soc., Papers and Records, V. 1, 1899, Pages 14-70. Lieutenant Lenard W. Meyers, Hastings Militia, date of commission is Dec. 12, 1798, dated Feb., 10, 1799. "Leonard Walden Meyers, Sydney, on 27 July 1804 did assault at Murray Twp, Northumberland District, Phoebe Smith, wife of John Smith, Murray, tailor" ... " with force and arms an assault did make and her, the said Phoebe Smith, then and there did beat wound and evil entreat and these to her other enormous things did to the great damage hurt her .."
MARY OR MARIA MEYERS (CAPTAIN JOHN WALDEN4, HANS JERG (GEORGE)3 WALDENMAIER, JOHANN GEORG2 WALTERMAIER, MATTHAEUS1) was born Abt. 1774 in near Poughkeepsie, NY, and died 1868 in Trenton, ON. 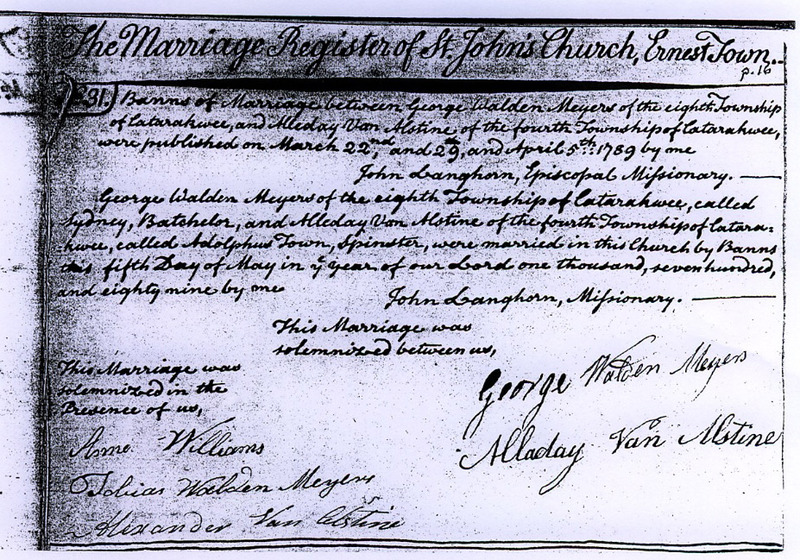 She married (1) JOHN BLEECKER 11 Nov 1797 in Kingston, Upper Canada. He was born Abt. 1762, and died 1807. She married (2) JOHN ROW Abt. 1808, son of PETER ROW. i. TOBIAS6 BLEECKER, b. 11 Jul 1797, Sidney Tp, Hastings; d. 19 Sep 1866, Thurlow Tp, Hastings; m. ISABELLA MARIANNE, Bef. 1822.
ii. GILBERT BLEECKER, b. 07 May 1799, Sidney Tp, Hastings; d. 26 Dec 1850, Sidney Tp, Hastings; m. MARY ANN WALKER, 07 Dec 1823, Belleville, ON. iii. CATHERINE BLEECKER, b. 1801, Sidney Tp, Hastings; m. JOHN WESLEY ORR, Aft. 1816.
iv. JANE BLEECKER, b. 1803, Sidney Tp, Hastings; m. WILLIAM RIPSON, Aft. 1818.
v. HENRY BLEECKER, b. 10 Aug 1805, Sidney Tp, Hastings; d. 15 Sep 1881, Sidney Tp, Hastings; m. SARAH LEAVENS, 05 Oct 1839, Sidney Tp. vi. SUSANNA6 ROW, b. Abt. 1808, Sidney Tp, Hastings; d. Bef. 1842; m. RICHARD HARDER, 11 Feb 1823, St Thomas Church, Belleville, ON. 2. vii. ELIZABETH (BETSEY JANE) ROW, b. Abt. 1808, Sidney Tp, Hastings; d. 05 Nov 1889, Sidney Tp, Hastings. viii. BENJAMIN ROW, b. Abt. 1811, Sidney Tp, Hastings; d. 29 Oct 1897, Murray Tp, Northumberland; m. CATHERINE SAVAGE, 31 Dec 1853, Victoria Dist, Hastings Co..
ix. MARY A ROW, b. 02 Feb 1815, Sidney Tp, Hastings; d. 19 Feb 1912, Trenton; m. BURLEIGH HUNT, Aft. 1830.
x. JOHN ROW, b. Mar 1817, Sidney Tp, Hastings; d. 05 Oct 1900, Sidney Tp, Hastings; m. ANGELINA ROSS, 16 Jan 1839, Sidney Tp. 16 Apr 1793, Mary W Meyers, daughter of John W Meyers Capt in the late Loyal rangers on her becoming of age prays as the daughter of a loyalist for 200 acres and it being found she is duly entitled to the same it is granted. Mary married John against her father's wishes. (He didn't think it was right for her to marry her sister's husband). They took a canoe down to Kingston and were married on Nov 11, 1797. While in Kingston, Mary's father showed up and Mary disguised herself as an Indian squaw and her father didn't recognize her. After he found out they were married he was reconciled. John Bleecker died of pneumonia in March of 1807. In abt 1808 Mary married John Row. John Row was born abt 1772 in Dutchess Co, NY and he died May 24, 1857 in Sidney Twp, Hastings Co, ON. Mary Meyers was born in 1774 near Poughkeepsie, NY (Bapt May 29, 1774 in Catskill, NY) and she died in 1868 in Trenton, Hastings Co, ON. Mary owned the front ferry plying the Bay of Quinte between Trenton and Belleville. 1. ANNA (NANCY)5 MEYERS (CAPTAIN JOHN WALDEN4, HANS JERG (GEORGE)3 WALDENMAIER, JOHANN GEORG2 WALTERMAIER, MATTHAEUS1) was born 1775 in Coxsackie, Greene Co., NY, and died 10 December 1844 in Belleville, ON. She married (1) CALEB GILBERT Bef. 1797, son of STEPHEN GILBERT. He was born in Ulster Co, NY, and died Bef. 1 December 1810 in Sidney, Hastings County. She married (2) THOMAS JONES. He was born Abt. 1765 in NY, and died Aft. 1833. See the two 1797 petitions below. They are submitted a few months apart and both state they are married to a Gilbert and when the land record from 1810 is included both are said to be married to Caleb Gilbert. Researchers have generally resorted to just stating that Anna Meyers and Nancy Meyers is the same person. 1. JACOB5 MEYERS (CAPTAIN JOHN WALDEN4, HANS JERG (GEORGE)3 WALDENMAIER, JOHANN GEORG2 WALTERMAIER, MATTHAEUS1) was born 31 March 1777, and died Abt. 1851. He married JANE MCKENZIE 1798. She was born 1780, and died 1858.
i. JOHN6 MEYERS, d. 1819.
ii. MARY W. MEYERS, b. 25 February 1801; d. 1895; m. LYMAN ASHLEY, 1829.
iii. NANCY W MEYERS, b. 1803; d. 1888; m. CALEB GILBERT, 1822; b. 1800; d. 1872.
iv. TOBIAS P.W. MEYERS, b. Abt. 1804, Upper Canada; m. ELIZABETH HIGLEY; b. Abt. 1810, Upper Canada. v. JACOB W MEYERS, b. 1809; m. (1) AUGUSTA FONES; m. (2) ELEANOR OR ELIZABETH SCHENCK. vi. JANE W MEYERS, b. 1811; m. JOHN WANNOCOTT. vii. GEORGE E.W. MEYERS, b. 1813; m. NANCY BURDETT. viii. BLEEKER W MEYERS, b. 1817; d. 1849; m. HANNAH WEBB; b. Abt. 1803, Ireland. ix. JOHN A.W. MEYERS, b. 1820, Upper Canada; d. 1899; m. LOUISE HILDRITH; b. 1818, U States; d. 1893.
x. SARAH ANN MEYERS, b. 1822; d. 1839. 1779 is the approximate birth year as calculated from the military record below. Source: Abstract Index, Sidney Tp., AO, GSU 197974, Lot 1, Con 3. Meyers, Jacob Walden is listed as a Captain (date of rank September 5, 1807) in the 1st Hastings Regiment. Meyers, Jacob Walden, Captain, is listed in the 1st Hastings Regiment, Flank Companies. He is charged with disobedience in 1814. Captain Jacob Meyers, 1st Regiment of the Hastings Militia, age 40, Sidney Twsp., Concession 1, Lot 9, dated 19 Jan 1819. Source: Early Militia Lists of Hastings County 1799-1826, from the William Bell Papers; compiled by Don Kellaway, 1994, Quinte Branch, OGS, p. 7. Jacob W. Meyers made a land claim as a militiaman who served in the War of 1812 - 1814 with the Flank Company, 1st Regiment Hastings Militia. Source: Index of the Land Claim Certificates, Lauber, OGS, 1995, p. 60: RG9, IB4, V. 22, pp. 416 - 421, NAC. 50 M viii. Jacob WALDEN MEYERS-2297 was born 31 Mar 1777 and died about 1851. Primary sources unknown.